Tuesday, 4 December, 2018, the Orthodox Church celebrates today the Feast of the Entrance of the Mother of God into the Temple of Jerusalem. This feast commemorates an event that happened when Mary was just a 3-year-old child and was consecrated to God following an oath given by her parents, blessed Joachim and Anna, who were childless and prayed God to give them a child. Virgin Mary remained in the Temple till she reached the age of 15, this being a common tradition of the Jewish people. The Temple had numerous chambers where children consecrated to God were raised and taught the Law of God and various handicraft for the needs of the Holy Place. Descriptions of this custom are offered in the Old Testament and multiple historical accounts, such as Josephus Flavius’s Antiquities of the Jews. Bible does not mention this feast in the early Christian community. However, early historical and liturgical texts dating back to the 4th century and little earlier mention this tradition. His Eminence Metropolitan Vladimir was assisted at the Divine Liturgy by the Cathedral Dean and metropolitan secretary, father Vadim Cheibas, and numerous clergy of the holy shrine. 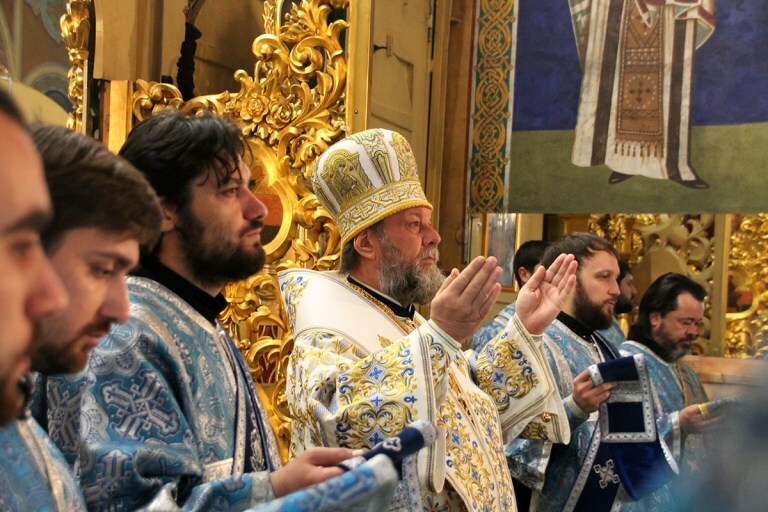 The service was especially emotional for deacon Marcel Baleca, who was ordained priest and appointed by Metropolitan Vladimir to priesthood ministry in St. Luke parish of Pecistea community, Rezina region. Thanks-giving prayers were uttered, and the praying community listened to a sermon about the meaning of today’s Feast and significance of the Fast before Christmas, or the Nativity of the Lord.